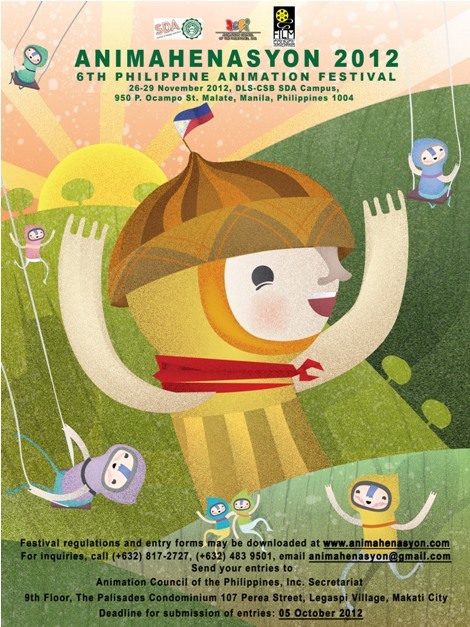 Philippine animation festival Animahenasyon celebrates its 6th year rounding up the country’s best works of animation. With a slew of entries from both local and foreign animators, the festival serves as the platform for both amateur and professional Filipino animators to share their work with the world. Slated on November 26-29, 2012 at the School of Design & Arts (SDA) campus of De La Salle-College of St. Benilde (DLS-CSB), Manila, the festival has attracted quality submissions from all over the archipelago, as well as from countries such as Portugal and Bulgaria. Apart from showcasing and awarding the best animation films through its multi-category competition, the festival is also recognizing the efforts of outstanding individuals who have contributed to the industry. One of these is talented independent animator Nelson “Blog” Caliguia Jr., who is set to be awarded the Outstanding Emerging Artist in Animation Award for 2012. A director, writer, and animator of several award-winning animation films, Blog has found success in the independent circuit in the years since graduating from DLS-CSB in 2007. According to Blog, he chose to pursue the indie path for more creative freedom, and to focus on his personal projects. “I chose this in my hope to make my career more meaningful and fulfilling,” he remarks. When it comes to any creative output, Blog believes that it all stems from imitation. He learns more about storytelling through reading and watching works of other skilled storytellers. “After enjoying the creations of these storytellers, I would be filled with admiration—an admiration that would lead to imitation, and the inspiration to make stories of my own,” he says. Blog can attest that Philippine animation is alive and well because it has already established itself as one of the main animation service providers in Asia, especially in 2D animation. However, Blog also acknowledges the challenges of the industry today with its service-provider model, which is difficult to sustain due to stiff competition. Contractual work can oftentimes be irregular. But despite this, he considers the future of Philippine animation to be very bright, mainly due to the advent of new sophisticated and easy-to-use animation software. Animahenasyon has played a key role in inspiring local animators with its yearly show of creativity and innovation in animation storytelling. Blog regards the festival as “the Philippines’ most prominent animation event,” which he credits to the persistence and efforts of the Animation Council of the Philippines Inc. (ACPI).